Born in Copenhagen and known as the 'Danish Johann Strauss', Lumbye was associated with the Tivoli Gardens orchestra where he was musical director for over 30 years. The series of CDs that were produced by Marco Polo of his works were recorded there. Lumbye received his musical education in Odense where he first played a trumpet in the local band. In 1829 he returned to Copenhagen playing trumpet with the Royal Horse Guards but at the same time played in the City Orchestra when he started to compose dance music. 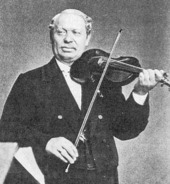 In 1840 he formed his own orchestra with 22 players, being inspired by the orchestras of Johann Strauss Sr. and Lanner. He started performing in one of the prestige hotels in Copenhagen and within 3 years was able to establish himself as leader of the Tivoli Gardens concert hall orchestra. He wrote a large number of polkas, waltzes and gallops, for which he is best known, but also wrote a number of fantasies and ballet music. He later increased the size of his orchestra to 33 players which enabled him to perform full symphonic works. He undertook concert tours to Hamburg, Berlin, Vienna, Paris, Stockholm and St Petersburg and was primarily responsible for bringing the dance culture to the northern part of Europe with his own style of composition, which reflected a Nordic taste. A fire in 1884 destroyed much of his material, but his musicians were able to reconstruct most of the scores from memory.